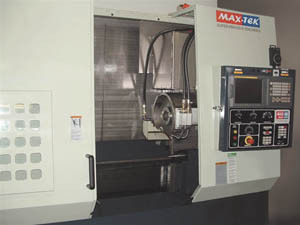 The STC-200 is ideal for machining aerospace and power generation variable vane journals and automotive shaft journals. The three axes (X/Z/C) STC-200 utilizes a substantial high tensile Meehanite base to provide superior rigidity and vibration dampening for efficient high speed superabrasive machining. The STC-200 has been designed for operator and maintenance efficiency.